Sergio Aguero scored his 150th Premier League goal as champions Manchester City powered back to the top of the table by thrashing Southampton 6-1. Raheem Sterling also struck twice while David Silva and Leroy Sane got on the scoresheet after an early Wesley Hoedt own goal in a one-sided contest at the Etihad Stadium. City, one of Hughes’ former sides, were rampant and all but wrapped the game up with three goals in the opening 18 minutes. They also hit the woodwork through Sane in a commanding display. Southampton could do little to halt City’s charge but Alex McCarthy did well to deny Aguero from a pinpoint Bernardo Silva pass. It did little to change the complexion of the game, however, and Southampton had to scramble to deny Aguero, Sterling and Sane shooting opportunities as the hosts teased their opponents with some intricate passing. 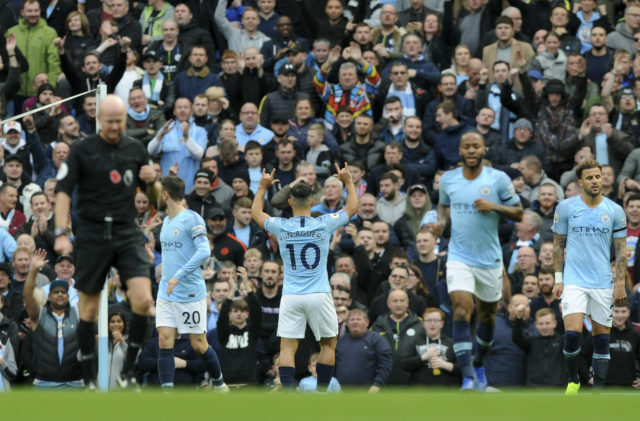 Aguero was booked after handling the ball and then bizarrely smashing it into the crowd in frustration and Sterling had a penalty claim dismissed but the flow was only briefly interrupted. City’s fourth came just before the interval as Aguero kept the ball in play at the byline and picked out Sterling. The England man scuffed his first effort but calmly stroked home at the second attempt after the ball rebounded off Ryan Bertrand.